What can you do about your hair loss? ‘The eyes are the windows to the soul’, they say. Taking that one step further, one could very well say that the hair is the window to your health. Any change in your mental or physical health, your hair will reflect it. However, few of us fail to realize this. All of us want gorgeous, luscious hair, but we do not realize that expensive hair treatments and trips to the salons are not the solutions. The solution, in fact, begins by understanding the root of the problem and then shows you ways to tackle it. On average, there are about 150,000 hairs on the head of an adult human. Shedding up to 100 hairs daily is considered normal. 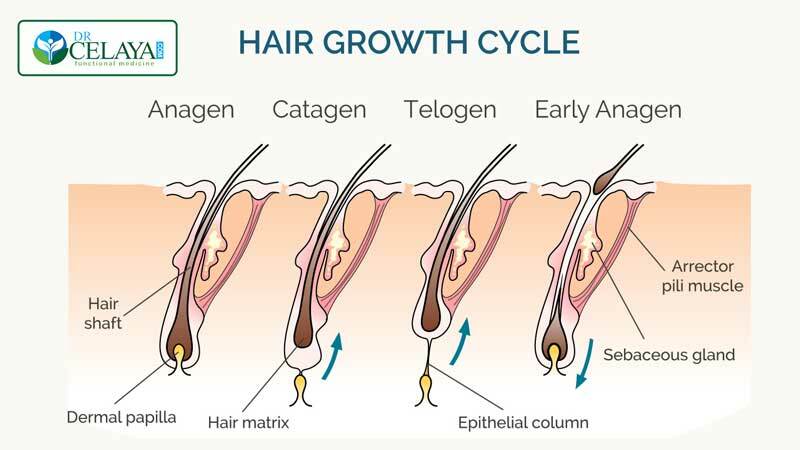 The hair growth cycle consists of different phases and at the end of the cycle, the hair is shed off and a new hair replaces it. The main structural component of hair is a protein called keratin. Apart from being an indicator of something being wrong with your body, hair loss in itself can be a cause of stress. It leads to insecurities, especially in women, and can lead to anxiety and depression. Thus, it is important to treat it and do so quickly. If you want to know more about what could be causing your hair loss, schedule for a FREE 15 Minute Consultation with Dr. Celaya. Alopecia areata is an autoimmune disease affecting the hair follicles. It occurs suddenly and leads to hair loss in patches. Certain nutrients such as zinc, iron, biotin, essential fatty acids and proteins are essential for maintaining the health and strength of hair. 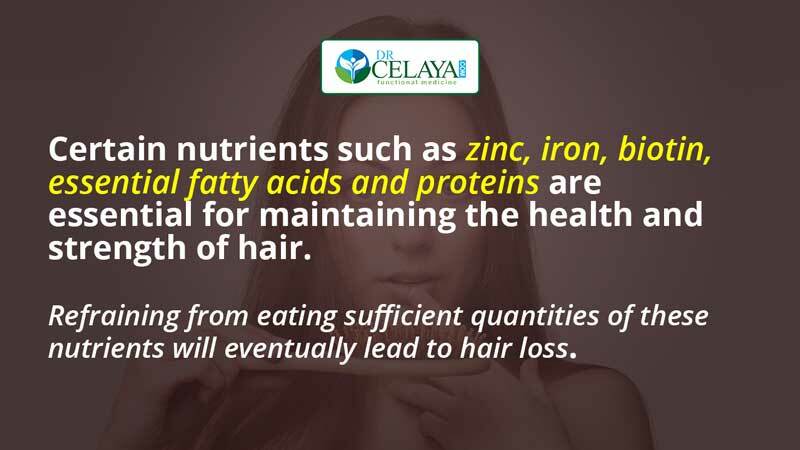 Refraining from eating sufficient quantities of these nutrients will eventually lead to hair loss. Anemia due to iron deficiency is also a leading cause of hair loss. Likewise, anorexia and bulimia also affect the health of your hair. Leaky gut can also target your hair due to poor digestive health and hormonal imbalances. 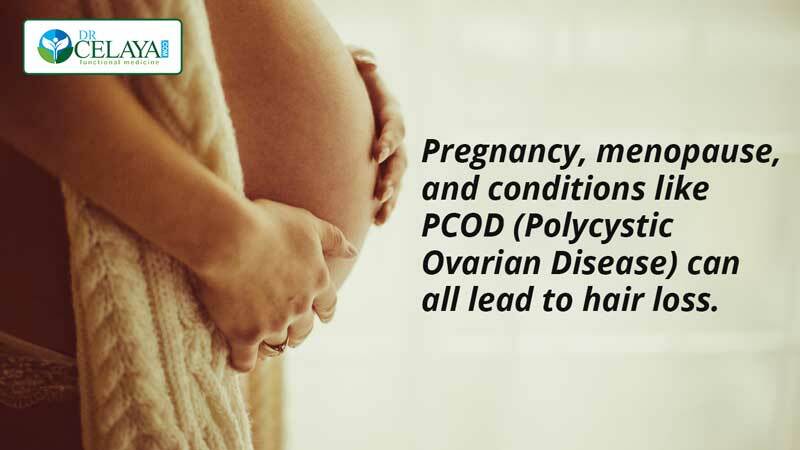 Pregnancy, menopause, and conditions like PCOD (Polycystic Ovarian Disease) can all lead to hair loss. Male pattern baldness also occurs due to androgens. Thyroid hormone imbalance is another common cause of hair loss, which can occur due to either hypothyroidism or hyperthyroidism. Any kind of prolonged illness or mental/physical stress to the body such as childbirth, sudden and drastic weight loss, accident, etc. can lead to hair loss. This condition is known as telogen effluvium and occurs because the stress tends to alter the growth cycle of your hair and shock a large number of hairs into the resting phase simultaneously. This leads to noticeable shedding of hair. Your prescription could be the reason for your hair loss. Implicated medications include antidepressants, contraceptives, steroids, etc. 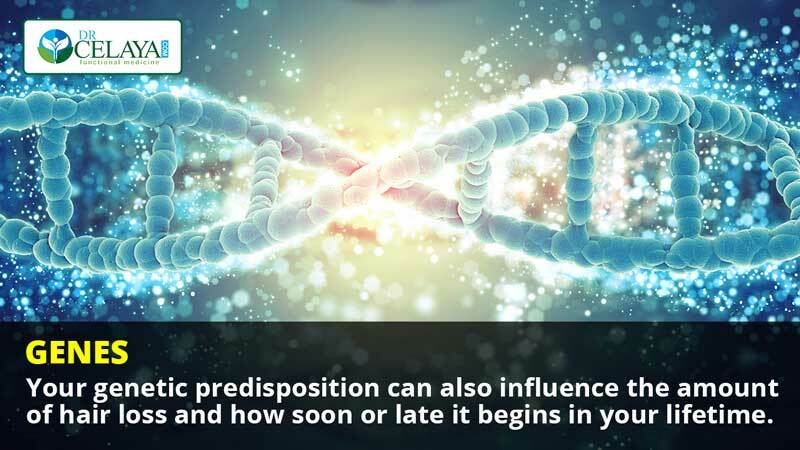 Your genetic predisposition can also influence the amount of hair loss and how soon or late it begins in your lifetime. Use of excessive chemicals and heat can weaken your hair and lead to temporary, or rarely, permanent baldness. Knowing the possible cause of hair loss is winning half the battle. Treatment starts by identifying the problem and eliminating causative factors if any. Drastic measures include hair weaves or wigs, local medications such as Minoxidil, and hair grafting. However, wigs and locally applied medicines are temporary fixes and not a cure for the problem. Hair grafting and laser treatments are expensive options and usually performed for a limited area of baldness. If an underlying disease such as thyroid dysfunction is diagnosed, treating it will automatically bring about an improvement in your hair. Telogen effluvium also ceases to cause hair loss once the stress is eliminated. Rich sources of omega-3 fatty acids include green tea, fish, chia seeds, and flax seeds. Salmon, chia seeds, and vegetable oils are also a good source of omega-3 fatty acids. If you are anemic, adding nuts, broccoli, spinach, and peas to your diet are recommended. If you are not getting enough veggies, click here. Biotin-rich foods include eggs, nuts, and milk products. You can also take vitamin B supplements to ensure that the requirements of your body are met. Adequate amounts of zinc can be consumed by adding oysters, beef, and chickpeas to your diet. Probiotic-rich foods can help repair your gut lining and heal leaky gut. Also taking probiotics can help. Exercising brings about a release of endorphins, which helps in relieving stress. Exercising regularly also improves your blood circulation, adding to the health of your scalp. Minimize the use of chemicals and heat on your hair. Try to avoid shampooing your hair daily as this strips the hair of moisture. By combining a base oil with a few drops of essential oil, you can massage your scalp yourself and aid in circulation to the scalp. This also can calm you and relieve stress. Coconut oil, rosemary oil, ginseng oil, etc. are some of the oils that can be used. Being stress-free is the key to having good hair. Meditation can help you achieve this goal. You can use simple breathing exercises or chants for this purpose. Moreover, not sleeping enough wreaks havoc with your hormones and also increases stress and anxiety. To avoid this, try sleeping for at least seven to eight hours every day. Acupuncture has been proven beneficial for hair loss and is often accompanied by dietary herbal supplements. Aloe vera conditions your scalp and maintains its pH. Twice a week, you can apply aloe vera gel on your scalp and rinse it out after two hours. Amla (Indian gooseberry) is a time-tested solution for all hair troubles and its juice can be applied to the hair. Other useful herbs include neem, sage, and lemongrass among others. Maintaining healthy hair is not difficult. By simply adopting a healthier lifestyle and a few simple changes, you can ensure that your hair continues to be your crowning glory, adding to your inner and outer beauty! If you want better hair health, you can get a free 15-minute consultation with Dr. Celaya.